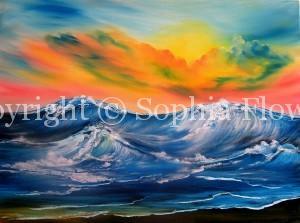 There are so many ways to paint waves and the above is just one of them. I just love using a gesso underlay so that the various colours, but especially the white, show through. Not only that, this way of painting waves allows me to go back over and over again and completely change a whole wave scene or delete a particular section just by using a baby wipe to remove and then add a little liquid clear with the appropriate colour on. To paint waves like this, simply add black gesso to the canvas. Allow to dry. Add liquid clear to cover the gesso without it being too much so that it dribbles. Then finally add in the colours you wish to show up in the sea bringing them alive with titanium white on top.